A day doesn't go by without a donor contacting us wanting to know how to stop charities from sending so many solicitations in the mail. 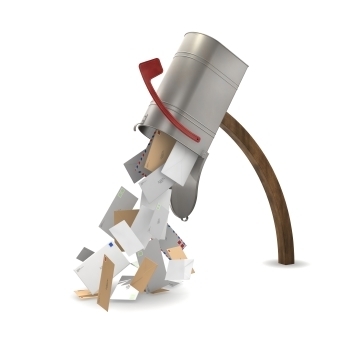 While there is no foolproof way of removing your name from all mailing lists, following these steps should allow you to see a decrease in the number of mailings you receive. Only donate to charities with a demonstrated commitment to donor privacy. Of the charities we've reviewed, many have 'opt-out' policies. We notify you when this is the case so that you, as a donor, know that you must tell the charity that you wish not to have your personal information distributed to any other entity. Depending on the charity, you can 'opt-out' either by calling, writing or clicking a button when making an online donation. Register with services that aim to stop junk mail. Although there is no regulation that mandates that charities (and corporations) honor your requests to opt-out of their mailing lists, these services may still be of help. Through the Mail Preference Service program, the DMA maintains a list of individuals that do not wish to receive unsolicited mail. Be sure to specify that you do not wish to receive solicitations from both commercial and charitable organizations. If you fail to do so, then the DMA will automatically place your name on the list provided to for-profit entities only. Take a photo of the junk mail you wish to stop and send it to PaperKarma. They’ll contact the mailer for you and ask that they remove you from their distribution list. You can report unwanted mail to Catalog Choice and they’ll process your request for you. Contact the charity that sent you the solicitation and ask to be removed from their mailing list. Additionally, ask for the contact information of the organization that sold them your name- the source of your troubles. Then contact that organization to request that it too refrain from selling or trading your personal information. Be sure you have the appeal letter on hand in case the charity needs specific information from it in order to locate your name in its records. Even if you plan to support a charity that sends you too frequent mailings, we recommend that you contact the charity and let its staff know of your giving plans. Will you donate once a month, once a quarter, or once a year? Responsible and well-run charities will welcome your call. They prefer to have donors that they can depend on to give without having to be reminded. This helps the charity improve its fundraising efficiency and ultimately dedicate more time and resources towards the programs you wanted to support in the first place. Refrain from giving small donations to many charities. The quickest and most surefire way to wind up on mailing lists is to make lots of small charitable donations. Small donations, such as $25, barely cover the costs the charity incurred in soliciting the gift. To recoup those costs, many charities will simply sell the donor's name to another charity doing similar work. Charities obviously tend to be much more protective of donors that give large gifts. The charitable marketplace is crowded with many charities pursuing similar missions. Since the majority of donations come from individuals and not foundations, corporations or the government, charities are in competition with each other for your donation. A charity would never divulge a mid- to high-level donor's personal information to another charity. The revenue it could generate by selling the donor's information simply doesn't outweigh the risk of losing that donor to the other charity. If you've taken the time to find an efficient and effective charity whose work in which you believe, then it shouldn't be too difficult for you to decide to concentrate your giving on that charity instead of spreading your money around to many charities with whom you are less familiar. If all else fails, give anonymously. Take advantage of Network For Good's online giving system which Charity Navigator uses to enable you to give online at our site. Their system offers the option of giving anonymously. Visit our website for more tips for donors.